White Mountain Hearth presents the Super Wildwood refractory log set. 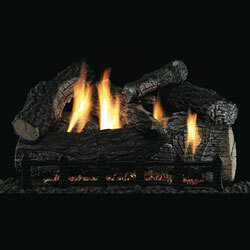 Huge, chunky logs with hand painted details will look perfect in even the largest fireboxes.Every aspect of the Super Wildwood from the charred curves to the deep bark is engineered to visually compliment the Vented/Vent-Free Harmony Burner.This remarkably rugged set is available in 24 and 30-inch sizes.Add a Decorative Cast Grate (shown) for the perfect finish. Our Harmony Burner serves as the basis for our premium line of meaty, massive log sets - the Wildwood, Super Wildwood and Canyon.Special baffles within the burner induce movement in the flow of gas to accentuate the naturally flickering flames. Our Vented/Vent-Free Burners are approved for use in any certified vent-free firebox.They may be installed in an existing wood-burning fireplace, with the damper closed, to operate as a vent-free heating system.Millivolt and manual burners are also certified for installation as vented log sets, so long as the installer blocks the fireplace damper partially open.A special flue-damper clamp is included with burner.